With almost everything over but the counting, here are some numbers to keep in mind before Tuesday’s vote. The White House disadvantage. 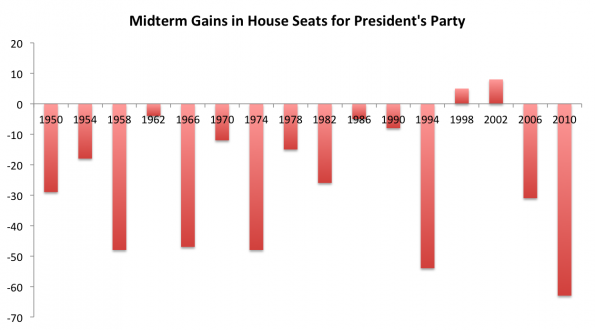 Midterm elections almost always go badly for the party controlling the presidency. Since the Civil War, the president’s party has lost seats in the House of Representatives in all but three midterms (1934, 1998, and 2002, the last following a rise in President George W. Bush's popularity after the 9/11 terrorist attacks). The National Journal’s Charlie Cook points out that things go especially badly in the sixth year of a party’s occupancy of the White House: “These losses have occurred in five out of six such elections since the end of World War II, averaging six Senate and 29 House seats.” The Republicans need exactly six seats to take control of the Senate next year. Seth Masket writes, “when the economy is stronger, the president’s party does better, or at least less horribly,” but the Washington Post's Matt O'Brien isn't impressed by just-released data showing that the Gross Domestic Product rose by 3.5 percent in the third quarter of 2014. "Beneath the headlines, growth was still just slow and steady, like it has been the whole recovery," he writes. That's nothing like the robust economy that helped Bill Clinton avoid congressional losses in 1998. Obama’s popularity. Slate’s John Dickerson predicts that Republican gains this year “will provide an unequivocal mandate for support of one proposition: widespread dislike of President Obama. That’s it.” The Huffington Post’s October 29 average of polls had Obama’s approval rating at 42 percent, with 53 percent voicing disapproval. That’s not terrible for a president in his sixth year (Bush was at 37 percent in an October 2006 poll), but the data not suggest the president is in any condition to buck history and win seats in Congress. At first glance, that doesn’t seem like a mandate. But we have a winner-take-all electoral system, in which the party with the most seats takes absolute control of a legislative chamber. And 61 percent of Republican voters say they’re casting a vote against Obama. That’s a clear message for the congressional leaders in the House, and possibly the Senate, who will be setting the agenda for Obama’s last two years. Loyalty to the president. Any doubt about how much the GOP is depending on Obama’s popularity can be dispelled by the many campaign ads attacking Democratic incumbents for supporting the president. Roll Call’s Niels Lesniewski looked at the numbers in CQ’s annual report on congressional votes and noted, “all of the most vulnerable Democrats voted with President Obama at least 96 percent of the time on the 120 votes on which Obama has urged a ‘yes’ or ‘no’ vote.” These include Alaska’s Mark Begich, Arkansas’s Mark Pryor, Colorado’s Mark Udall, Louisiana’s Mary Landrieu, and New Hampshire’s Jeanne Shaheen, North Carolina’s Kay Hagan. Over the past decade, there has been a cultural shift in Americans’ attitudes about the principle of universal health care coverage, one of the main rationales for the ACA. In 2007, during the presidential primary season, public support for the view that the federal government has a responsibility to make sure all Americans have health insurance coverage was at 64% (Gallup, 2007). By 2014, this number had declined to 47% (Pew, January–February 2014). In addition, there has been a decline in overall public trust in the federal government to handle domestic problems such as health care from 51% in 2012 to 40% in 2014, which may also play a role in depressing public support for the ACA (Gallup, September 2014). This change in view is not a good sign for Obama or the Democratic Party, and Republicans are still hoping to knock off incumbents who supported the president on the ACA. One ironic development is that Obamacare has faded a bit as a campaign issue as the public becomes obsessed with an infectious disease, the Ebola virus, that has so far been limited almost entirely to western Africa. The idea that universal access to health care is a vital strategy in limiting the spread of disease does not seem to be catching on. Given the Republicans’ current strength across rural areas and in conservative suburbs, the loss of every Hispanic voter would not be enough to cost them the 17 seats that would flip House control.… [H]eavily Democratic districts are concentrated in metropolitan areas, while much of the country’s geographical area tilts Republican—and is still heavily non-Hispanic white. In districts held by House Republicans, Hispanics represent only 6.7 percent of eligible voters and an even smaller share of the electorate. The American Prospect’s Chris Kromm, referring to slightly older data, writes that $13.50 has been spent per registered voter in North Carolina (and most of these voters will not cast ballots this year). In Arkansas, which has seen less spending but is much smaller, the figure is $34.8 per registered voter. Competitive House seats. The New York Times’s Derek Willis writes, “How small is the field of competitive House races? So narrow that just 25 contests account for 80 percent of all reported outside spending in the general election.” Outside spending refers to political action committees and other organizations not controlled by the candidates themselves. Willis reports that Arizona’s 1st congressional district has attracted the most outside money, more than $10 million (out of a national total of $137 million). The interest in knocking off the incumbent Democrat in that district, Ann Kirkpatrick, says something about how much the Republicans are determined to bolt down their geographic base. Arizona is currently the only state in the country that voted for Mitt Romney but has a majority-Democratic delegation in the House. Big spenders. According to Public Citizen, this year’s biggest “dark money group” (whose contributors are not publicly disclosed) is the U.S. Chamber of Commerce, which has spent $31.8 million in 35 races, almost always backing the Republican candidate. Coming in second is Crossroads GPS, affiliated with Republican strategist Karl Rove, which spent $23.5 million. A distant third is the League of Conservation Voters, at $9.5 million.